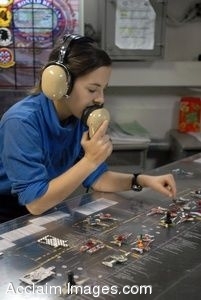 Description: Clip art photograph of Aviation Boatswain's Mate (Handling) Airman Amber Wilcox, from Baltimore, updates the ouija board in hangar deck control aboard the Nimitz-class aircraft carrier USS Ronald Reagan (CVN 76). Ronald Reagan and Carrier Air Wing (CVW) 14 are providing support to coalition forces on the ground in Afghanistan. Ronald Reagan is deployed to the U.S. 5th Fleet area of responsibility. (U.S. Navy photo by Mass Communication Specialist Seaman Briana Brotzman). Clipart photograph by Department of Defense Public Domain.